Hair treatments are an essential in my routine on a weekly basis, so I'm always on the lookout for new products to try. 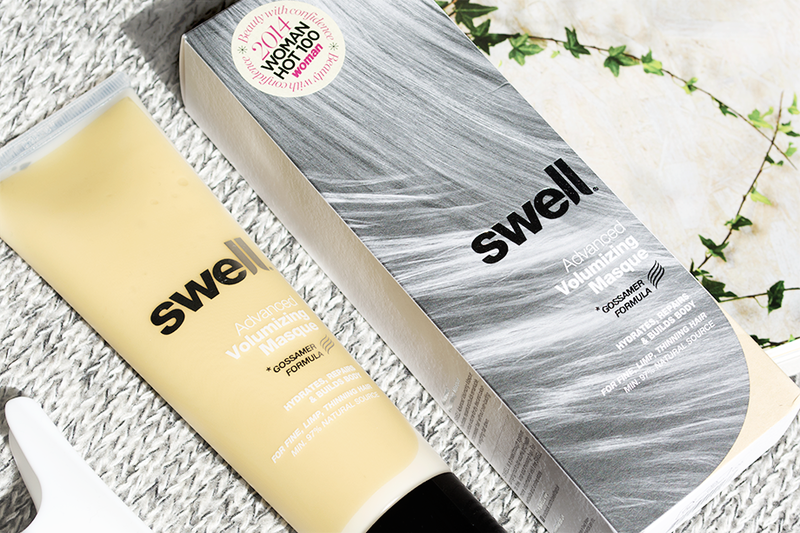 Swell are a haircare brand that I've watched from afar for a good year or so now as they've been making a great impression within the beauty world. Swell was developed with fine and thinning hair in mind, with a focus on repairing the hair and adding volume. Although I wouldn't consider my hair to be fine, I have been noticing it's not quite as thick as it used to be so I'm always more than happy to have a boost in volume! Swell's Advanced Volumizing Masque* is recommended as a once weekly hair treatment in place of conditioner. After shampooing, you apply the masque to the mid-lengths and ends of your hair - the instructions recommend quantities and times based on the length of your hair. Short hair requires only a small 5ml amount and can be rinsed out after 2 minutes. For long hair like mine, Swell recommends a more generous 10-20ml to be left on for up to 10 minutes. The formula is lightweight, yet still hydrating enough to deep condition dry and colour processed hair. This masque also aims to repair the hair, restore elasticity and build volume. It has a pleasant herbal scent, but no need to worry if you're sensitive to scents as it does fade once rinsed! After using this masque, I find that my hair feels much softer and my waves have noticeably more body and shine too. It's rare to find a volumising product that actually works! This masque comes packaged in a sturdy squeezable tube, priced at £28.00 for 150ml. There's also 50ml trial/travel sizes available too which would be great for testing a few times to see how you like it. I'd consider Swell's product range to be on the luxury side of things, but I think they're definitely worth checking out - not just for the fine-haired among you, but for anyone looking for a boost in volume! Have you tried any products from Swell before? Thanks for the brand introduction! I've never tried their products before, but they sound swell (sorry for the cheesy pun). Haha I had to resist from adding a pun in my review :) Glad to have introduced you to the brand! This sounds amazing. I've got thyroid disease so have always had annoyingly thin hair. When I'm back in the UK I'll be investing in Swell to put some life into my hair. Thanks.